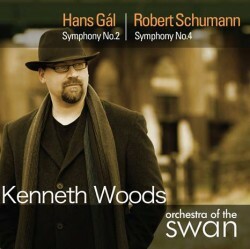 Kenneth Woods, Principal Guest Conductor of Stratford-upon-Avon based Orchestra of the Swan, has made international headlines for his ongoing cycle of world-premiere recordings of Hans Gál’s Symphonies. The set, paired with the symphonies of Robert Schumann, has been featured on National Public Radio’s All Things Considered and Performance Today, The New York Times, The Washington Post, in Gramophone and BBC Music Magazine, and dozens of other newspaper and online reviews, introducing a new generation to Gál’s wide-ranging and extensive oeuvre. Woods and OOTS continue the cycle with Gál’s Second and Schumann’s Fourth. The Gál, written in 1942-43 during the darkest war years, is perhaps the most personal of the composer’s four symphonies. With an emotional depth and haunting beauty, the symphony distils the process of overcoming pain and loss into the language of pure music. Composed a century earlier, Schumann’s Fourth is arguably his most popular symphony.